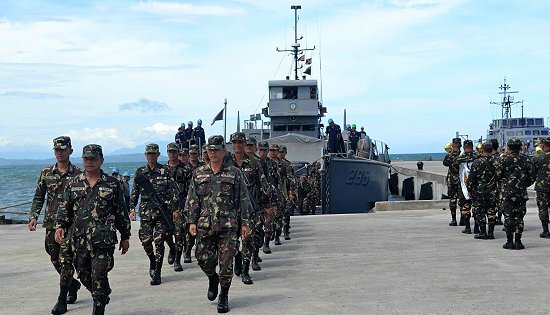 CAMP LUKBAN, Catbalogan City Samar – One company of soldiers deployed for nine (9) months in Cebu arrive in Catbalogan City via a Philippine Navy transport ship on September 18, 2013 at Pier 2. Captain Rex A. Carranzo, Commanding Officer of Bravo Company, 34th Infantry Battalion, led his troops in disembarking from the Navy ship and in marching off to the eagerly waiting families, friends and comrades in a welcome ceremony held in their honor at Pier 2, Catbalogan City, Samar. The welcoming party was led by Brigadier General Virgilio M. Espineli, Assistant Division Commander of 8th Infantry Division. The said troops will initially undergo one (1) week of refresher seminar anchored on human rights and Bayanihan team activity prior to their redeployment to Northern Samar. This seminar will prepare them in the community services that they will provide to the people of Northern Samar upon redeployment. CAMP SEC. KANGLEON, Palo, Leyte – A stronger partnership between the military and the police will benefit the people in Eastern Visayas and will usher prosperity and progress, the region’s top police official said. “The convergence of effort between the Philippine National Police and our counterparts in the Armed Forces of the Philippines, together with the active support of other stakeholders, will ensure a peaceful atmosphere and will drive economic development,” said PCSupt. Elmer R. Soria, director of Police Regional Office 8 (PRO8). He added that he will closely coordinate with Brig. Gen. Jet Velarmino, the newly installed Commanding General of the 8th Infantry Division of the Philippine Army, in neutralizing the insurgency problem and maintaining the peace and order in the region. Soria and Velarmino belong to the Philippine Military Academy “Sandigan” class of 1982. “We will be working together to crush terrorist and criminal activities which undermine peace and stability in Eastern Visayas,” Soria disclosed. The police official also lauded the achievements of Maj. Gen. Gerardo T. Layug, Velarmino’s predecessor, in addressing the insurgency problem during his 17-month stint as the region’s top military official. “We wish Sir Layug the best on his retirement. With 37 years of dedicated service to our country and the Filipino people, he certainly deserves a grand vacation and relax with his family,” Soria added. It was during Layug’s watch that the province of Eastern Samar was declared as “Manageable Conflict-Affected and Development Ready Province” on 25 March 2013. Meanwhile, the litmus test for the strengthened AFP-PNP partnership will be the barangay elections next month wherein some 2.6 million voters will select their village leaders. “Just like in the May midterm elections, we will be working closely with the military in various security operations to ensure a peaceful barangay polls,” the police official averred. This joint effort include the establishment of joint AFP-PNP checkpoints, the campaign against loose firearms and neutralization of wanted persons, to include members of the New People’s Army (NPA). The PRO8 and 8th ID PA have also jointly conducted several internal peace and security operations in the past that led to the neutralization of several NPA leaders, including the arrests of Maricar Adlao alias Diwa/Apple, Political Officer of the Eastern Visayas Regional Party Committee (EVPRC); Allie Tafalla alias Macao, Secretary of Section Committee of Central Samar, Samar Provincial Party Committee (SPPC); Juan Paolo Rodrigo Verzosa alias Kokoy, Intelligence Officer of the SPPC and his wife Grace alias Lenon, Staff of the Reproduction Bureau, EVRPC in Brgy Fortune, Marikina City and Esther Belicario alias Edna Montes, Secretary of Provincial White Area Committee in Eastern Samar. PASAY CITY – Senator Chiz Escudero said Senate should continue with its investigation on the priority development assistance fund (PDAF) rip off despite the filing of plunder charges against some senators, congressmen and individuals in the P10-billion pork barrel scam. Escudero, chairman of the Senate committee on finance said, in sustaining its own investigation, affords the public the venue to be informed with the facts of the case through testimonies under oath. The senator added that there are still many facts to be had surrounding the siphoning of lawmakers funds to bogus organizations. Escudero, the principal author who asked the Senate to probe the scandal had asked the committee to call for Janet Lim Napoles, tagged as the mastermind of the scam. Other whistleblowers and key personalities already mentioned in Luy’s narration should also be called before the Senate, he said. During last week’s hearing, Escudero requested for the appearance of the manager of Metrobank’s Magdalena branch where Napoles was said to have made a onetime withdrawal worth P75-M.
CAMP LUKBAN, Catbalogan City – A Testimonial Review in honor of Major General Gerardo T Layug AFP and Change of Command ceremony was held yesterday at the Headquarters of the 8th Infantry Division. 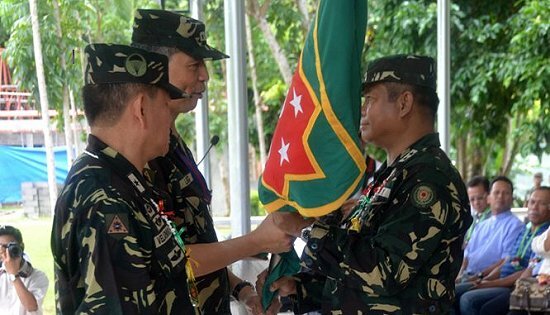 Brigadier General Jet B Velarmino AFP took over the Command of the Division from Major General Gerardo T Layug AFP who officially retired yesterday after serving the Armed Forces of the Philippines for 37 years. Major General Samuel L Narbuada AFP, Inspector General, Philippine Army represented Lieutenant General Noel A Coballes AFP, the Commanding General, Philippine Army as the Guest of Honor and Presiding Officer. Distinguished guests and awardees from the public and the private sectors namely: Hon. Jose L Ong, Governor of Northern Samar; Hon. Conrado B Nicart Jr, Governor of Eastern Samar; Hon. Emil Ong, Representative 2nd District, Northern Samar Hon. Harlin Abayon, Representative 1st District Northern Samar; Most Reverends Isabelo C Abarquez, Bishop Diocese of Calbayog and Emmanuel Trance, Bishop of the Diocese of Catarman. Other awardees sent their respective representatives to receive the awards are the following: Hon Sharee Ann Tan, Governor of Samar represented by Ms Hannia Tan, Tourism Officer; Hon Ben Evardone, Representative Lone District, Eastern Samar represented by Hon Marcelo Ferdinand Picardal; and Hon Mel Senen S Sarmiento Representative, 1st District, Samar represented by Hon Charlie Cońejos, Board Member 1st District of Samar. And likewise the invited guests that also sent their representatives were; Hon Leopoldo L Petilla, Governor of Leyte represented by Hon Mesias Arevalo, Board Member 4th District of Leyte; Director Manolito D Ragub, Regional Executive Director DENR, RO8 represented by Marciano Talavera, Technical Director for Forestry; Director Jose Nick Mendros, Regional Director COMELEC, RO8 represented by Atty Ma. Corazon Montallana; Director Rolando A Asis, Regional Director, DPWH, RO8 represented by Engineer Efren Padilla; Director Rey M Gozon, Acting Regional Director, OCD8 represented by Bhenlie Linde; Director Edgar A Catarongan, MPA, Regional Director, LTO, RO8 represented by Mr Ruben Mancol, OIC, LTO Catbalogan and Stephany Uy Tan the City Mayor of Catbalogan represented by Hon Bembot Bermejo City Councilor. In his farewell speech, Major General Layug acknowledged the professionalism and commitment of the soldiers of the 8th Infantry Division and the support and cooperation of the public and the private sector partners who have worked with him to make Region 8 a better place to live-in and made 8ID as one of the best Infantry Divisions of the Philippine Army for Calendar Year 2012. The newly designated 8ID Commander, Brigadier General Jet B Velarmino called on the personnel of the Division and the partners in the civilian sector to continue pursuing effort with the local officials and community leaders as well as the citizenry . “I envision that under my charge, the soldiers of 8ID will give the genuine spirit of “Bayanihan” alive. I will definitely work by defining the framework of the AFP Internal Peace and Security Plan (IPSP) Bayanihan and the Army Transformation Roadmap (ATR). CAMP KANGLEON, Palo, Leyte – The Barangay Peacekeeping Action Teams (BPATs) have a key role to play in crime prevention, according to the top official of the Philippine National Police in Eastern Visayas. Police Regional Office 8 (PRO8) director PCSupt. Elmer R. Soria said that the PNP, with its myriad and diverse tasks and functions that are so huge have been slow to respond due to its sheer weight and enormousness as compared to crime and criminality that have become so dynamic, inadvertive and fast. “Time calls for the “creative dismemberment” of such PNP tasks and functions, the empowerment of the community to formulate and implement its unique policing practices, projects, programs, procedures and priorities,” said Soria. “This creative dismemberment of PNP dinosaur spawned small Barangay Peacekeeping Action Teams which are trained, equipped and are fast, agile and responsive to the needs of the community and works at the ground level where crime operates,” the police official added. “They are an effective tool in the effective prevention, control and suppression of crime and efficient management of disasters and emergencies and are valuable partners in the development of the community,” the region’s top cop said during Wednesday culmination program of the 19th National Crime Prevention Week at PRO8’s Matapat Hall. The general concept of Barangay Peacekeeping is to involve the barangay officials, tanods, Civilian Volunteer Organizations, Barangay Auxiliaries, Non-Government Organizations and other People's Organization in the task of crime prevention, control and suppression in partnership with the PNP from the Provincial down to the Community Precincts level and the Local Government Executives and Heads of Concerned Agencies. The BPATs, as the main actors, conducts community-based activities and information campaign in support of the PNP’s anti-criminality effort, internal security operation, and disaster management and control program. Soria informed that 4,118 out of 4,390 or almost 94 percent of barangays in the region have organized BPATs wherein close to 30,000 participants were trained on the concept of BPAT that include lectures on law enforcement, disaster relief, conflict resolution and environmental protection. “They are really of big help as force multiplier in maintaining the tranquil peace and order situation in the region,” the police official averred. MANILA – Save the Children expressed its disgust over reports that some P10 billion pesos of legislators’ Priority Development Assistance Fund (PDAF) have been allegedly channelled to fake non-government organizations (NGOs) through businesswoman, Janet Lim Napoles. Save the Children is an international child rights organization that has been implementing programs and services for children in the Philippines for more than thirty years, directly and in partnership with non-government organizations (NGOs). “In a country where almost half of the population lives on less than ninety pesos a day, where young children continue to die from malnutrition and drop out of school because of poverty, where basic services do not reach remote communities and where people sometimes even have to pay extra to access health and education services, reports of private persons and politicians living ostentatiously and getting wealthier through public funds is nothing short of scandalous,” says Anna Lindenfors, Save the Children Country Director. As the investigation into the PDAF scam unfolds, it reveals the systemic and organized way in which the corruption has been taking place involving the legislators’ pork barrel funds. “Children, as the biggest segment of the population that access basic social services, are the most affected by this kind of corruption. The ineffective spending of public funds has been one of the major barriers to realizing children’s rights and welfare. Money that allegedly went to the pockets of Napoles should have gone to improving access to essential services such as health, education and protection services for children especially in areas where these are absolutely lacking. As a signatory to the Convention on the Rights of Child, the government has the obligation to use its resources to the maximum extent to deliver these basic services in order to fulfill the rights of children especially those who are marginalized,” adds Lindenfors. Save the Children further noted the lack of transparency and accountability throughout public expenditure processes. “We need to look beyond the pork barrel scam and into addressing issues of transparency, equitability, effectiveness and accountability in government spending. While we would want more resources for children, there should also be better spending that includes all children, especially the most marginalized. Even if government invest more money in education or social protection, for instance, if there is corruption, like a leaking faucet, these investments will not be able to produce the outcomes that we want for children,” Says Cabiles. National statistics also point to the relationship between education and health status and governance. Figures from the National Statistical Coordination Board’s Good Governance Index (which includes political governance, and health and education indicators) shows that many provinces who ranked low in the Good Governance Index are the same provinces considered as the worst performers on the Child Development Index, a composite of indicators covering education, health and quality of life for children. - adopt systemic and systematic solutions to curb corruption at all levels. Save the Children further calls on Congress to assume its key role of maintaining the balance of power by supporting the public clamor to abolish the pork barrel and reclaim its “power of the purse” by demanding that the details of all discretionary funds be put under its scrutiny as part of the General Appropriations Act. DSWD 7 Regional Director Mercedita Jabagat (center) and RAFI Micro-finance Executive Director Ma. Theresa Catipay (rightmost), together with a representative from Venray Construction (leftmost), sign the memorandum of agreement for a program that would help poor communities through micro-enterprises. 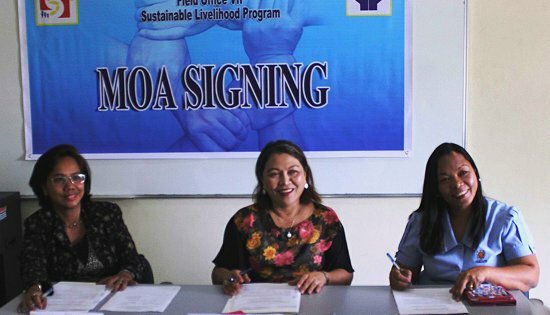 CEBU CITY – To provide access to capital among Pantawid Pamilya Program (PPP) beneficiaries, the Department of Social Welfare and Development (DSWD) Field Office VII and Ramon Aboitiz Foundation Inc. (RAFI) Micro-finance inked a memorandum of agreement for a livelihood program last July 30. The partnership will implement an area-based sustainable livelihood program that will enable poor families to actively participate in the local economy as entrepreneurs. “Both DSWD and RAFI would like to see empowerment of disadvantaged individuals and their families for an improved quality of life. We are here to provide access to capital for a more sustainable micro-enterprise,” Ma. Theressa Catipay, executive director of RAFI Micro-finance, said. The program will initially pilot in selected cities/municipalities in Cebu Province to be identified by the parties within a period of one year. The major activities include the profiling of Pantawid Pamilya households in selected cities and municipalities for partnership, orientation, and trainings in relation to the cooperation project, and continuous business development for the program's beneficiaries. As part of the agreement, DSWD will validate the eligibility of the PPP beneficiaries and endorse the beneficiaries to RAFI Micro-Finance to be formed into groups (a minimum of 20 members each). It will also provide technical assistance and continuing capability building support and conduct social preparation and training workshops, Community Driven Enterprise Development (CDED) sessions, and other interventions for the beneficiaries that may be deemed necessary during the implementation of the partnership. On the other hand, RAFI Micro-finance will screen the endorse applicants. When accepted to the program, they will be clustered to groups of 10-20 or integrate them to existing Pantawid Pamilya groups in their respective barangays. RAFI Micro-finance will provide access to additional capital for the micro-enterprises of qualified beneficiaries and regular trainings and seminars, either as center meeting interventions or group or individual business consultancy services. An evaluation of the results of the program will be the basis for expanding the program to other areas to be identified by the parties as long as resources are available to fund the program. “Through our partnership with the institution, we are able to increase our reach and extend our services to more individuals and their families,” Catipay disclosed. At present, more than 17,000 nanays from the 17 branches in Cebu, Leyte and, Bohol branches are availing the loan, saving, and insurance services of RAFI Micro-finance. RAFI Micro-finance is a program under the Micro-finance & Entrepreneurship focus area of RAFI, providing financial resources and know-how to women micro-entrepreneurs to nurture financial independence and entrepreneurship. Other focus areas of RAFI are Integrated Development, Culture & Heritage, Leadership & Citizenship, and Education. PASAY CITY – The Commission on Audit (COA) is undermanned and their staff is overworked but the agency has a 42% unfilled position, the senate committee on finance today found out. At the agency’s budget presentation today, Senator Chiz Escudero said the authorized COA staffing is 15,219 but its filled rate is only 8,737. This leaves 6,482 unfilled positions for 2013. Escudero, chairman of the senate committee on finance said this wide margin of vacancy is a cause for concern, which he said even COA itself is alarmed. “The COA is doing its job. In fact the government has saved up a lot by what the COA does in terms of auditing services”. With only 57% filled position, the senator asked the commission if “it could have rendered more auditing services and could have detected the misuse of funds” if it has more people to do their mandate. Heidi Mendoza, COA Commissioner who presented the agency budget said they could have used more personnel to double their output than their current ones. COA cited difficulty in getting accountants to join the agency as the reason for vacant positions remaining unfilled. The agency has generated almost P2 billion of savings from these unfilled positions. Having been given a fiscal autonomy, the amount was already disbursed to them. When asked how it utilizes this lump sum amount, COA said this is being used to augment their maintenance and other operating expenses (MOOE). “Can you furnish us how this amount augments your operations? Where else does this go?” Escudero directed COA. The senator also asked the agency who audits them. “Forgive me if this maybe a unique question, but who audits COA ma’am?" “We have our own auditor and as I mentioned a while ago, our own auditor issues audit observation addressed to us” Mendoza replied. Escudero said it is quite awkward that the agency is being audited by one of its own where the nature of check and balance might be put in question. “But your auditor reports to you too? I mean, they are under you, where is the check and balance? Again this is no allegation, no accusation, just out of curiosity”. Mendoza said the set up has been that way since COA was established. She said the agency tries to preserve the independence of its auditors “and in fact when they have audit observations, we too conduct exit conference and discuss the issues one by one, but we understand that reality”. Escudero said if COA has been self-auditing since its inception, it could look and adopt international auditing practices and standards to apply not only to themselves but to the government wide system as well. “COA said they have been rolling out international standards in auditing system. Be that as it may, Congress may still find ways to improve their current system to remove any doubts and fears and to also maintain the check and balance between their auditor and themselves”. The agency’s budget hearing has been deferred by the committee because some senators who were not present today manifested their intentions to ask questions regarding COA’s budget. The hearing will be rescheduled second week of September, Escudero said.